Saving Montgomery Sole Blog Tour - interview and US giveaway! Montgomery Sole is a square peg in a small town, a girl with two mums forced to go to a school full of homophobes and people who don't even know what irony is. Her saving grace - her two best friends Thomas and Naoki. Monty's obsessed with paranormal mysteries like ESP, astrology, superpowers, and the healing powers of frozen yogurt, but when strange things actually start happening to Monty, she realizes that the greatest mystery of all is herself. Now to the interview! Thanks so much Mariko for stopping by the blog. What was your favourite book when you were the same age as your characters? By sixteen I was heavy into Canadian Lit: Alice Munro, Margaret Laurence, Timothy Findley and Margaret Atwood. I think my favorite book was Stone Angel. If the Eye of Know existed, what would you use it for? Ah the Eye of Know is a complex thing! I wouldn't want to get anywhere near something that would give me any other sight or power beyond what I've got. Maybe I would borrow one to find my keys every once in a while. Do you have any writing or editing rituals? I've recently discovered the joys of the Pilot fountain pen, and writing my outlines with a really good pen on really good paper. If you could meet any author living or dead, who would it be? I'd love to meet Shakespeare, just run into him in line at the grocery store so I can turn to him and say, "So explain Romeo and Juliet to me." What's your favourite book and movie? Oh my gosh it changes so often. I would probably say my favorite book is this collection of non-fiction essays called The New Kings of Non-Fiction edited by Ira Glass. YA-wise I'm a huge fan of Sherman Alexie's The Absolutely True Diary of a Part-Time Indian. Movie wise I love director Sophia Coppola, although I spend a lot of time rewatching XMen films. Finally, here's the link to the Rafflecopter giveaway! Macmillan are generously giving away 5 copies of the book - open to the US only. Recovering from the accident that most definitely killed him, Gideon finds himself with strange new powers and a bizarre cuff he can't remove. His death has brought to life his real destiny. He has become War, one of the legendary four horsemen of the apocalypse. Over the coming weeks, he and the other horsemen--Conquest, Famine, and Death--are brought together by a beautiful but frustratingly secretive girl to help save humanity from an ancient evil on the emergence. They fail. 'Under the Never Sky' is one of my favourite YA series of all time - a fantastically original dystopian with a beautiful love story. 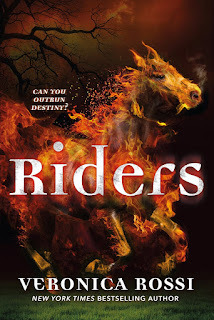 This meant I was super excited about Riders and I enjoyed it just as much as I hoped I would. The premise of a teen becoming one of the four horseman of the apocalypse was really unique and executed well. I enjoyed seeing Gideon and the other characters coming into their powers and thought the creatures they encountered were super creative. The big bads were also suitably scary and the plot conflict gathered speed and went off with a bang. Another thing I loved was Gideon as a narrator. I love male narrators in YA and it's rarer than I'd like in this type of book. I also know very little about the mindset of wanting to go away to war and it was interesting to get inside Gideon's head. The love story involving him was sweet but not overpowering. It unfolded naturally from the story rather than being crowbarred in. The only aspect I was less keen on was that the structure of collecting the other chosen ones felt a little familiar, in a sort of cross between Percy Jackson and the Avengers. This is a really promising duology and I'm looking forward to the next book!